The Gospel, the Great Commission, and the accomplished victory of Christ the King. Everything in Christ’s creation was made by, through, and for Him. While unbelievers are inherently inclined to corrupt the good things throughout Christ’s creation, their acts of corruption are fleeting and temporary. Their acts of corruption are anything but permanent. They do not succeed in forever claiming territory for the enemies of Christ. Thursday, having been named for the “god” Thor, was not successfully claimed for him in any meaningful way, share, or form. The day still belongs to God. If anything, the tag just looks silly now in connection with a long forgotten and disregarded figure known mainly as a Marvel super-hero. Similarly, homosexuality advocates who claim the rainbow as a symbol of their cause have not somehow succeeded in taking ownership of the rainbow. The rainbow belongs to God, as does every other thing in His creation. The fact that some pagans have aimed to take it, twist it, and make it their own, does not in any way whatsoever mean that they have or ever will accomplish that task. The rainbow is, and forever shall be, God’s property. Just like everything else in His creation. It’s all His. Right now. It’s all been made by, through, and for Him. While those clinging to pride, darkness, and rebellion love to imagine and pretend that His reign over the things that He has made is reserved for some future time and distant place, we are here to proclaim the most hated truth to ever hit unrepentant human ears: Repent and believe, for the Kingdom of Heaven is at hand. Repent, believe, and be saved! Christ as King…right now. 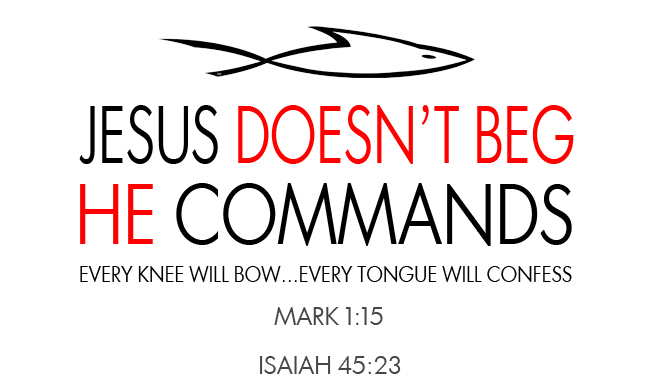 The test of true obedience is the desire to know and actively obey what the King has commanded. The coming righteous wrath of the holy King against all who would cling to pride and rebellion against His Nature as revealed in His Word. If His Word was not binding right here and now, there would be no sin to repent of. We are lovingly commanded by Christ to repent right now because our actions here and now are indeed subject to His Word. When we reject His Word on anything, we reject His Nature, since His Word is a revelation of His Nature. Scripture is not merely some set of rules or principles by which to live or through which to better appreciate life; it is literally a detailed revelation of the One by whom, through whom, and for whom all things have been made. This is the message that we are to share and apply in every realm of life, right here and right now. This is the mission – the Great Commission – that we have been given. This world is filled to the brim with folks who have no interest in such truth. They have no appetite for such a King. They despise the thought of bending their knees and wills to Him in practice in the way they pursue art, economics, business, education, or any number of other “live and let live” realms that they imagine to exist. He is King of the political realm. He is King of the economic realm. He is King of the arts, sciences, and everything else. He owns them all, whether we like it or believe it or not, and He will judge every act in every realm of His creation by the standards made plain in His Word. That is why we proclaim the loving command to repent, believe, and be saved. King Jesus is not hoping that anyone will “vote for Him” or choose Him to be their God. Everything in His creation belongs to Him. With every moment that passes by, we grow closer to the end of this age and the dawn of the next. The matchless beauty of His true and total lordship over all of His creation should inspire ever-increasing awe, gratitude, and loving obedience to Him in this season and every other. To learn about making a much appreciated (and much needed) financial contribution to the FBC cause, please click here.